In my job at the Society of Antiquaries of Scotland, I meet many members of our organisation (who are called ‘Fellows’), several of whom work at National Museums Scotland. In the few years I’ve worked here, I’ve learned a lot about the stories behind some of the amazing objects that connect the Society and the Museum. As the oldest antiquarian society in Scotland, founded in 1780, the Society was born during an exciting period of intellectual energy renowned as the Scottish Enlightenment. Since its foundation, it has provided an independent forum for the study, conservation and enjoyment of Scotland’s past, and today shares its wealth of knowledge and resources with people around the world. The antiquities that Fellows like Sir Walter Scott and Alexander Henry Rhind originally collected and left to the Society now form the basis of the internationally important collections at National Museums Scotland, transferred to the nation by the Society in the mid 19th century. The Society continues to contribute books and objects to National Museum Scotland’s collection. Read on to discover the Society’s story behind five Museum objects I’ve picked out. Thanks to Society Fellow Sir Daniel Wilson (1816-1892), a Scottish antiquarian and archaeologist, these two important medieval objects were successfully returned to Scotland after they were taken by the then hereditary keeper, Archibald Dewar, when he moved to Ontario, Canada in 1819. They were one of the first donations received in the new museum building in the mid 19th century. This beautiful medieval bishop’s crook and silver-gilt case, or Coigreach, are associated with St Fillan of Perthshire, and are among the most important medieval Scottish church artefacts. 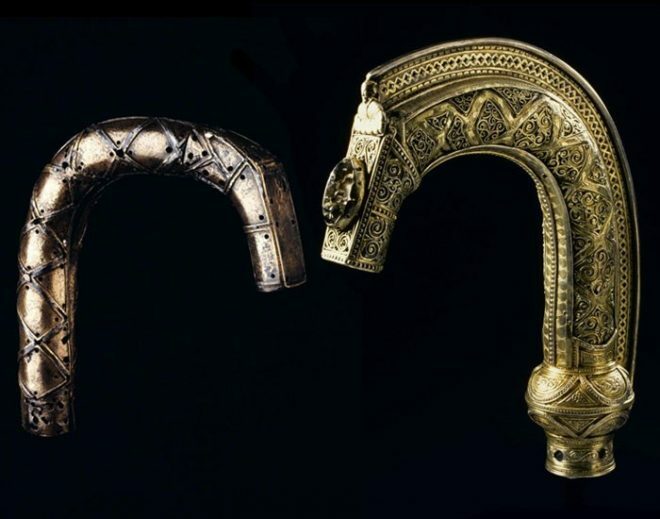 The St Fillan’s Crozier dates to the late 11th or early 12th century and is made in the characteristic West Highland style, decorated with niello, a black mixture of copper, silver and lead sulphides often as an inlay in Celtic jewellery. The Coigreach, created at a much later date, is a silver-gilt reliquary, which was made as an elaborate shrine to encase the St Fillan’s Crozier. 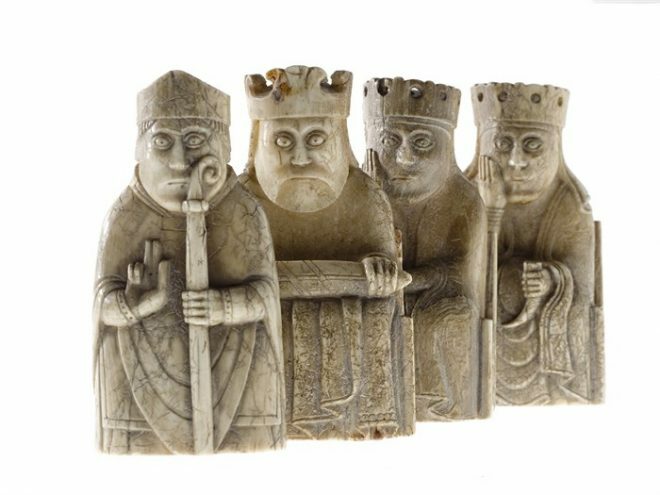 The group of 93 distinctive 12th-century chess pieces were discovered on the Isle of Lewis in 1831 and are thought to be some of the few complete, surviving medieval chess sets. When found, the hoard contained 93 items: 78 chess pieces, 14 table pieces and one belt buckle. They were exhibited at a meeting of the Society of Antiquaries of Scotland later that year. Today, 82 pieces reside at the British Museum and the remaining 11 are owned by National Museums Scotland. This is the oldest book in the Research Library collection and its title translates as ‘On the Genealogy of the Gods’. It was presented to the Society in 1783 by Fellow David Stewart. This book was a key reference work on classical mythology for more than 400 years, examining the genealogy of the pagan gods. 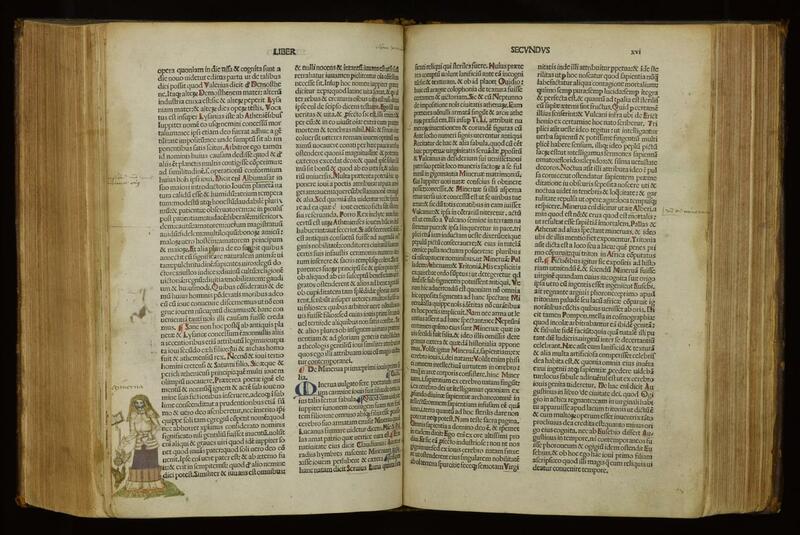 The author, Giovanni Boccaccio, wrote the book in Latin prose and completed the first edition in 1360. The first printed edition was in Venice in 1472, shortly followed by an edition of 1473 which was the first book printed in Leuven. The edition of the book in the Research Library is thought to have been printed in 1487, and is one of the first examples of printed text with hand-drawn illustrations in the margins showing mythical characters such as Pan and Minerva (pictured below). The Mary Queen Harp is an example of a Clarsach, a small harp with wire strings, used in the early music of Scotland and Ireland. 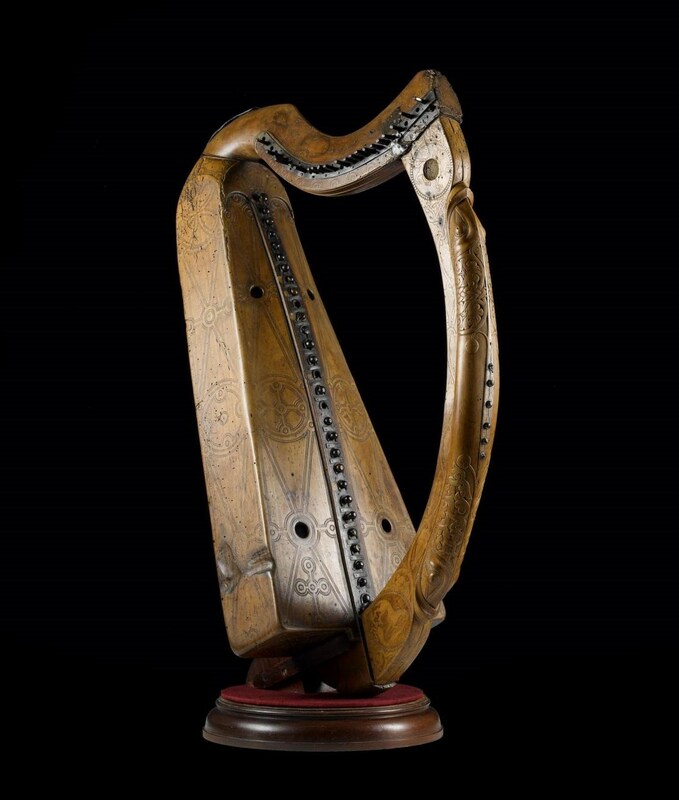 The Society did not donate the Harp to the Museum collections, but did provide funding in 2017-18 for high precision radiocarbon dating of the object. The harp was made in the West Highland region c. 1500, and is said to have been given by Mary Queen of Scots to Beatrix Gardyne of Banchory in 1563. It is also said to have been adorned with a gold portrait of Mary which could be the reason for its association with her. 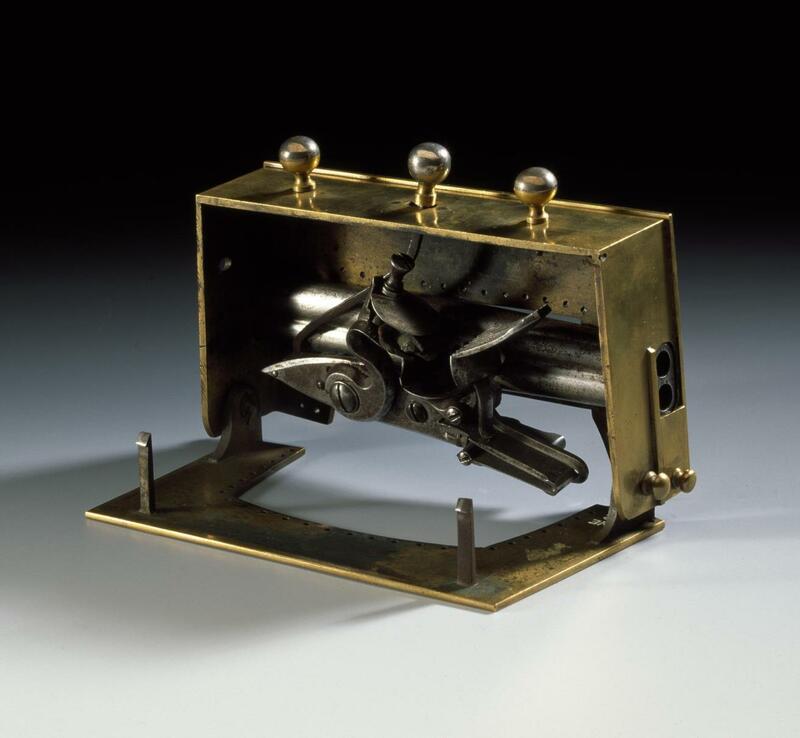 This brass and steel sporran clasp (dated 18th or early 19th century) was given to the Museum by MacNab of MacNab. It is a unique clasp that hides a deadly secret…four concealed pistols which would fire if the sporran was not opened correctly. This was probably the inspiration behind the weapon that Sir Walter Scott gave to his hero in the novel Rob Roy published in 1818. As well as a famous writer, Sir Walter Scott was also a keen antiquarian and became a Fellow of the Society of Antiquaries of Scotland in 1796, and Vice-President from 1827 to 1829. More information on the Society’s activities, free public lectures and how to join can be found here. 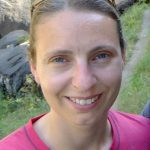 Such a nice collection of articles specifically the Sporran clasp, Never knew such an artifact exist in the history.